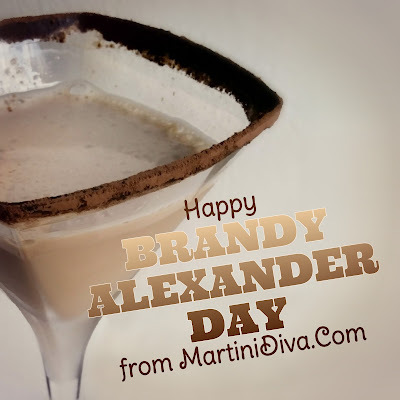 Yes, there really is a national holiday set aside for the Brandy Alexander! Did you know the Brandy Alexander made an appearance on the pilot episode of The Mary Tyler Moore Show? It was also featured in the movie The Days of Wine & Roses where Jack Lemmon buys Lee Remick the drink because she loves chocolate but doesn't like the taste of alcohol. Brandy Alexanders are smooth, delicious and taste like a chocolate shake so they can be quite a dangerous cocktail. Like Feist says in the album The Reminder Brandy Alexander, "goes down easy" and "always gets me into trouble". Here's a fun recipe for Brandy Alexander Brownies to go with your Brandy Alexander Martini.